Depicting the cutthroat, knee-jerk politics involved in the hierarchy of organized crime has long been a staple in the crime-thriller genre, but few have the gusto to focus on the hard psychology of the players involved, though, whether it's of the high-profile criminals or the undercover cops trapped in their web. That seems like ideal territory for Korean writer/director Park Hoon-jung, who recently put himself on the radar by penning an unsettling, cerebral revenge picture in I Saw the Devil. Thus, he's created New World: employing hefty doses of violence and pathos along the way, it's a darker depiction of an undercover cop who's acclimated to the business to a point where he's uncertain of where his allegiances lie. What this visceral director ends up creating is another brutal expression of complex moral grayness in the vein of his previous success, a stylish and hardheaded character study where the decisions of a mole are absorbingly unpredictable as his grasp on security further disappears. Enlisted at a young age for a long-con assignment, undercover cop Ja-Sung (Lee Jung-Jae) has gradually worked his way up the food chain in the Goldmoon organization, a corporation-sized mob rackett under heavy surveillance for ... well, almost all the illicit activities levied against in-power mobster families. A significant shift in their architecture has occurred, though, the mysterious death of the current chairman, leaving the other higher-ups -- two in particular, the logical second-in-command successor, Jung Chung (Hwang Jung-Min), and a fierce entrepreneurial underboss (Park Sung-Woong) -- vying for the position through strong-arm vote swaying and quasi-political discussions with the other heads. Ja-Sung's handler, Kang Hyung-Chul (Choi Min-sik), exploits this opportunity: they've set in motion "Operation New World", designed not to bring the organization down, but to control their activities from within. On the verge of snapping and with a child on the way, Ja-Sung struggles with his allegiances when his handler forces him to cooperate with this new plan, just when he believes he'll be able to pull out. There isn't a clear line between virtuous and corrupt sides in New World; in fact, Park Hoon-jung goes out of his way to complicate one's point-of-view of Ja-Sung's confliction over which side is up, involving the brotherhood bond and financial benefits of organized crime and his thankless, by-the-balls service to the force. Hell, the film almost completely glosses over the shady business that the Goldmoon corporation actually does to earn the police's attention, outside of a quick glimpse at their records and the violence they employ. Doing so allows for a multifaceted, gray-area exploration of an undercover cop's outlook on the infrastructure and reactionary practices of the organization, as well as his handler's oftentimes cruel manipulation to keep him in the game. While one might consider that to be an insincere lack of detail to skew the audience's awareness (and they wouldn't be wrong), it does allow for a more direct glimpse at Ja-Sung's shaken state in their midst. Scenes involving his updates and debriefings with Kang Hyung-Chul might typically come across as a safety zone elsewhere, but they're simply another situational battlefield. The grit and raw emotion that Park Hoon-jung's writing gave I Saw the Devil carry over in diverse, more controlled ways in New World, as violence and raw suspense are used sparsely to highlight the momentum of the mob politics. It doesn't really start that way: a grueling torture scene is shortly followed by a punchy car-wreck at the beginning, telegraphing edge-of-your-seat apprehension. The tone shifts to more interpersonal and situational tension, though, those sequence instead serving as fearful reminders of the business in which Ja-Sung operates as the power-play over the Goldmoon's throne kicks into gear. Hard-hitting violence occurs, especially in the third act, but Park Hoon-jung's isn't interested in transforming this into a visceral endurance run. There's cleverness in his restraint, and he really knows when the time's right for blood to spill in terms of maintaining matter-of-factness. When a beaten, weak body appears or a gun fires, the impact hits on both sensory and emotional levels. Park Hoon-jung captures New World in a fairly down-to-earth visual tone through the eyes of Park Chan-wook's regular cinematographer, Chung Chung-Hoon, allowing the viewpoint to either follow what Ja-Sung sees or to focus on his own internal disposition as he acclimates to Goldmoon's ever-changing surroundings. Most of the film employs colorless, stony tones that compliment the grayness of Ja-sung's emotional state, adorned either by the smoothness of expensive clothing or the grimy texture of his meeting spots with Kang Hyung-Chul. The age and expressions on faces plays a crucial role in grasping the tempo of what's going on around the undercover cop: the textured, sly charisma of his direct boss and "brother", Jung Chung; the piercing glances of the opposing running mate; and the weathered, almost-soulless look in his handler's eyes as he's being cornered into directives. 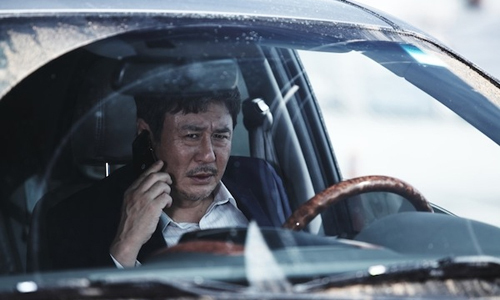 As previously mentioned, New World isn't aiming to one-up the stylized violence found in many Korean crime flicks, instead more concerned with keeping an eye on tense, engrossing wordplay that has its own aggressive cadence. 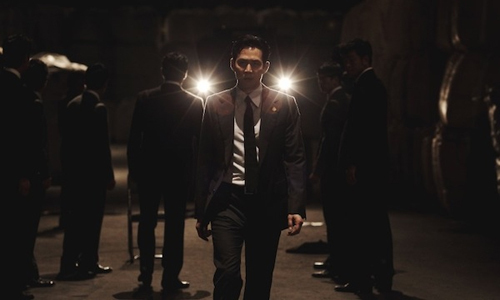 While it may be a stretch to say that Ja-Sung's rise in the Goldmoon organization and his place in Operation New World are a realistic depiction, Park Hoon-jung handles the no-way-out situation with enough sensibility and humanism to become a convincing exploration, perhaps more thematically provocative than the likes of Infernal Affairs or Hard Boiled. Due in no small part to the performances of Lee Jung-Jae and Choi Min-sik, this becomes an observation of an undercover cop's challenging and multifaceted poker face as he approaches his cracking point. Eventually, Ja-Sung finds himself in a position where he's forced to choose between the two sides of his existence, and a true testament to the craftsmanship here comes in the fact that it's pretty difficult to predict which direction he's going to go -- towards noble thanklessness or appreciated power -- let alone whether he makes the right choice. Needless to say, it's not a film that takes the easy route as it ends in an unpredictable, brutal rush.